Now there are few things in this world, whether Snowboarder or Skier, that ranks higher on the wishlist than having a helicoter lift you to a peak in a remote and desolate area, gently lift you off, allow you to strap in and bolt down the face of a mountaing, covered in virgin snow. The location in the desolate and remote arctic mountains of greenland, with a view of the fiords and ocean on the way down does not make it any less of a dream. During Easter that dream came true for me. I got one of 3 slots as test dummy on the pilot training programme for the pilots flying it. 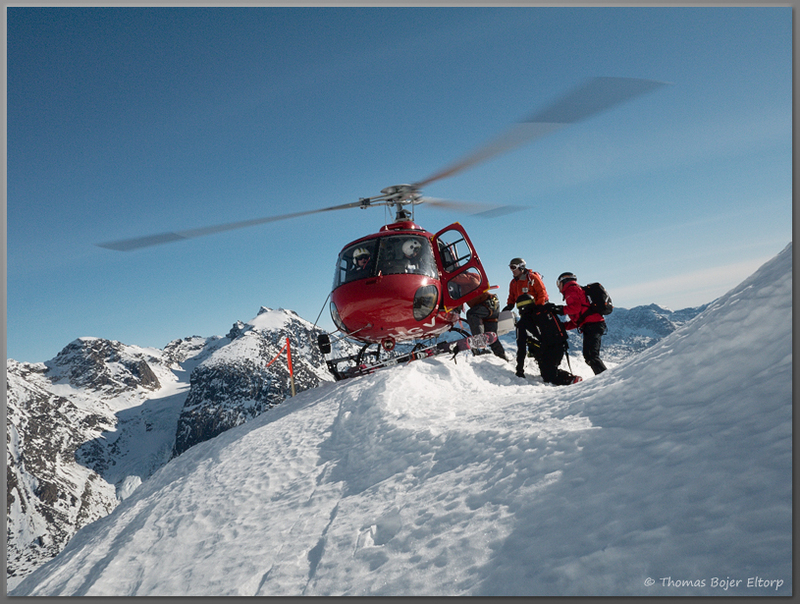 In short it, meant that we spend two days going over pretty much all relevant aspects of a heliskiing operation. Flight theory - with whiteout precautions and mountain flying brush ups. Security and emergency procedures - Including use of sheds, hoist out procedures and or transport of shed in a smaller helicoter. To sit through all of this together with the pilots and two super experienced guides, before even getting close to a helicopter, was an amazing intro to the actual snowboarding and skiing. 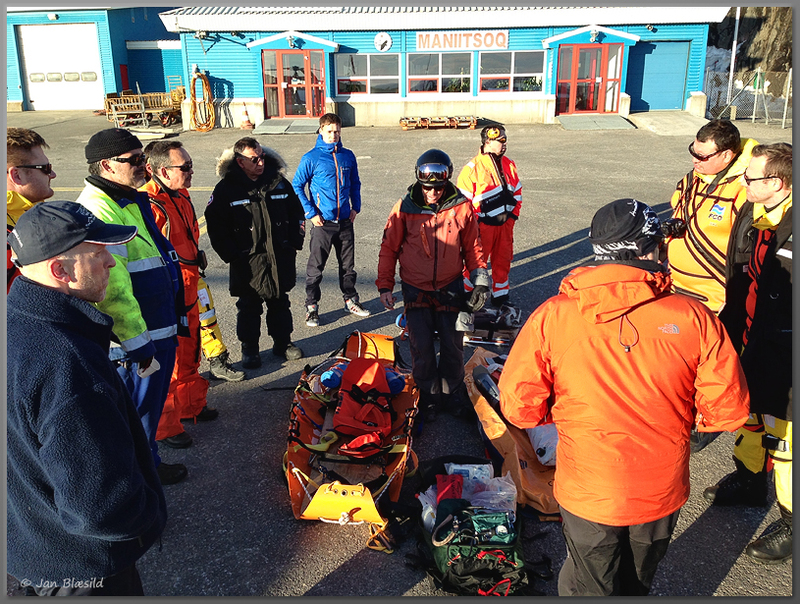 That we got to take part in a real emergency exercise, with the Greenlandic SAR team , including hoist and everything, came as quite a surprise, but it made for another interesting experience. Heliskiing is a blast, it is thrilling and amazingly fun, but also a serious business, with an equally serious set of risks associated. 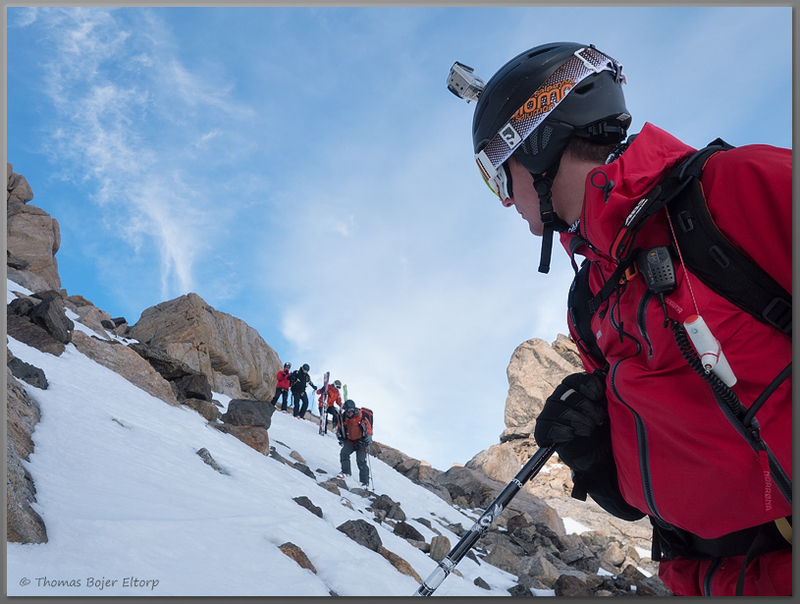 Avalanche beacon, showel, probe, airbag, helmet and radio are all mandatory ingredients. Now radio and airbag may seem over the top, but if you are doing big runs in remote areas, then some extra precautions do make sense. 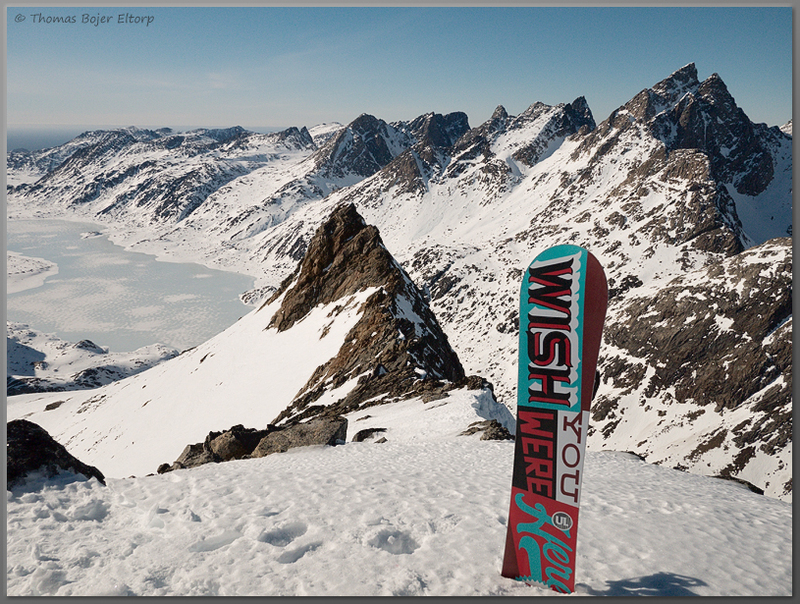 I mean if heliskiing in Greenland you will be you, a couple of mates, 1-2 guides and a heli and that is it. No access roads, no ambulances, just wilderness. ﻿﻿﻿﻿Reliable guides is another very mandatory element when being in an area this remote. While I normally never mention any names or cmopanies, then I think our guides deserves a mention and a recommendation. 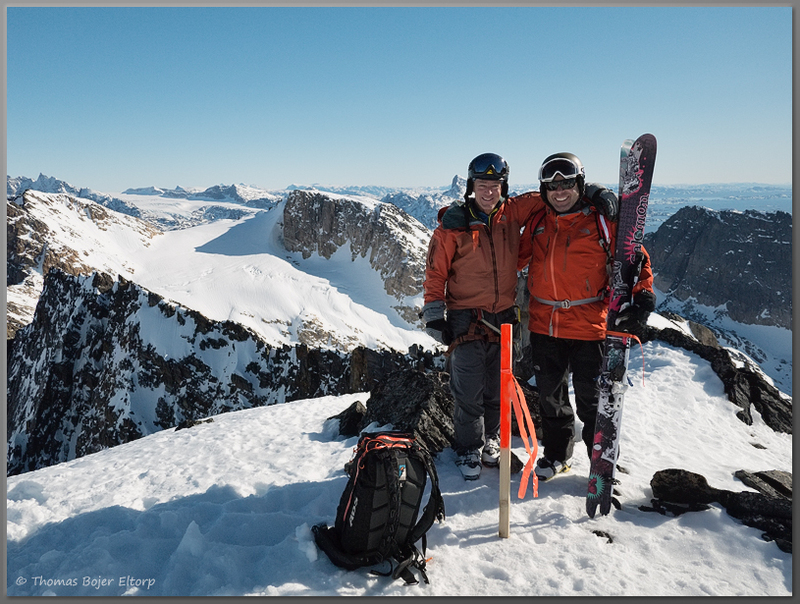 We were guided by Pete Patterson (www.mountainspirits.com) and Kevin O'Rourke (www.powderbirds.com) . Pete has been guiding the area for 14 years and Kevin for 10, they are certified heliskiing guides and used to running the show, which shows in both their approach and ability to guide their customers.I think a good rule in an area this remote is to use guides qith loads of local knowledge and with extensive experience in general. it makes it safer and funnier. We got to see a very wide variety of runs including packed glacial runs, drop off points that seemed bare big enough to step off the helicopter runs with plenty of big and small boulders providing narrow runs and small drops. long travers runs that at least for a boarder was not the most funny runs in the world, but none the less it felt amazing to traverse a huge glacial face in a leisurely pace seeing crevasses from above and below. And several sections steep enough to make most of think twice before setting off. We all had our fair challenges on the runs, as the boarder in the group mine was mainly not to sink into the habit of just blindly following the guides, skiers and boarders tend to ride different lines. We were blessed with truly amazing weather throughout our stay, not just good, but amazing. The weather definitely added to the experience, as well as the unique and breathtaking views. 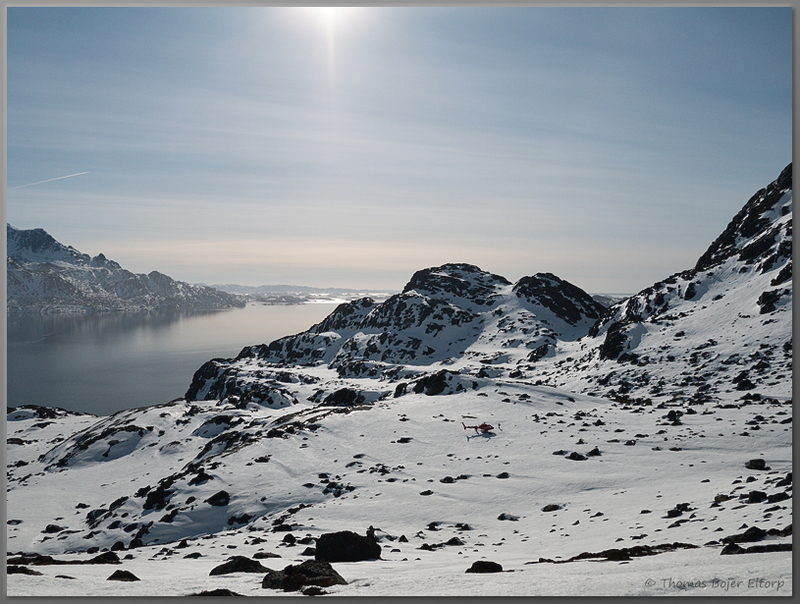 There is just something to skiing peak to fiord. Making each run both visually and technically a transition from steep peak over rolling canyonlike parts into swift narrow turns with plenty of technical turns between rocks and boulders where only a board and a half would fit, to sections jumping from patch of snow to patch of snow. until being able to tuch the water. ﻿﻿we were 3 guys and 2 guides making for two flights to get everybody on top, getting to see the drop offs up close made for a healty does of respect for the almost supernatural flying skills of the pilots. We never once felt at risk, yet we were continuously impressed with their ability to drop us off in palces where i would have claimed it impossible get off. 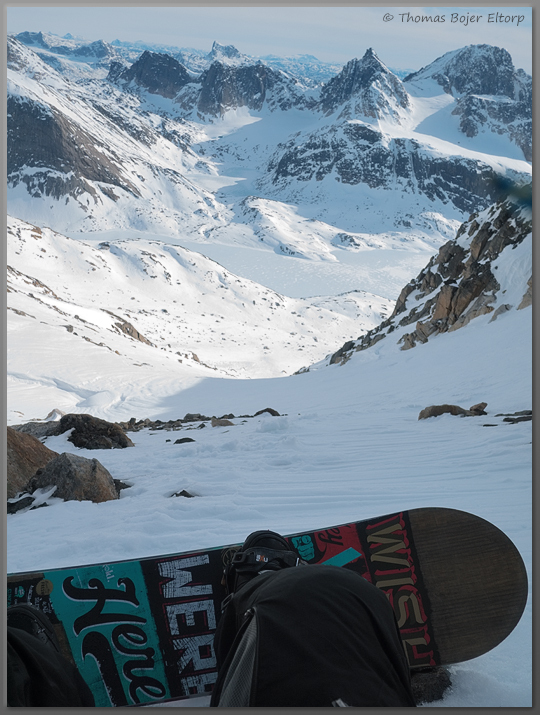 I could go on forever on the magic wonders of a trip like this and how wonderful it was and how much it even for a trip with less than perfect snow turned into both some of the most cahllenging snowboarding 8 years in Greenland have brought me and the most amazing and unique skiing experience I have ever had. The solitude, the views and the people combined some pretty sick snowboarding really makes for a once in a life time experience here. - No other place on earth will allow a similar experience with a snowboard, simple as that.